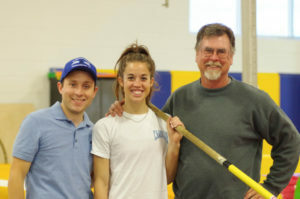 Aim High Pole Vault Club LLC was started to improve the quality of the pole vault in the state of Virginia. We firmly believe that the pole vault is the greatest sport in the world and we want to teach it to you! We focus on long-term skill development to help you reach your goals past the high school level and as our former vaulters’ improvements will show, we believe that there are no shortcuts in learning to pole vault properly. Many of our former vaulters have achieved success at the NCAA and post-collegiate level, including several NCAA Division 1 All-American and USATF national championship top three finishes. We also have a “drop-in” time for our out of town friends for $35 per session. Please contact us ahead of time to let us know you will be coming to check availability. All athletes must have a copy of their current USATF membership card. Kyle Bishop is a native of Prince George County Virginia. His love of sports began at an early age; inspired by his father who had been an accomplished baseball/fast pitch softball player during the 1940s and 50s. Coach Bishop began as a multi-sport athlete in the early 1970s, but after viewing the 1976 summer Olympic Games on television, he was motivated to give track and field a try. Which brings us to the now well-known story of a teammate remarking that Bishop didn’t “look like a pole-vaulter”; the statement was as good as a challenge to Coach Bishop, who set about from that day to prove him wrong. Unfortunately, the lack of experienced pole vault coaching in the immediate vicinity made it difficult to accomplish this goal. Bishop didn’t give up. The first step was to gather as much information on the subject as possible. He began with the very limited resources provided by the local libraries. This was actually the beginning of a lifelong quest for knowledge of everything related to the pole vault. While attending high school, he worked in order to raise the necessary funds to purchase his own poles and be able to pay the attendance fees for summer pole vault camps. By the end of his high school career, Coach Bishop held the school record, was All-Region, and had competed in the State Championships several times. Also during this time, while still a student-athlete himself, Kyle began to coach his teammates in the pole vault, thus launching his coaching career. Later, while working his way through college, Kyle continued to coach many successful central Virginia high school vaulters. By doing so, he gained years of coaching experience even before graduating from VCU with an Associate’s degree in Sociology and a Bachelor’s degree in Kinesiology. Upon graduation in 1985, Bishop began his teaching career and also accepted a coaching position at Lee-Davis High School in Hanover County, Virginia. Kyle saw the great need for strengthening the pole vault in central Virginia. 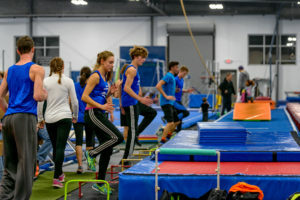 In order to aid in that endeavor, he launched his Aim High pole vault clinics, aimed to assist not only athletes but coaches as well to improve their knowledge of the pole vault. In the almost thirty years since its beginning, the Aim High clinics have been attended by athletes who later went on to become state champions, NCAA All-Americans, and even Olympians. In the beginning, the main struggle had been to preserve the pole vault in the state of Virginia. Thirty years later, that struggle is ongoing. Bishop was also an early champion of the women’s pole vault in Virginia, coaching females back before it was officially sanctioned by the VHSL. Coach Bishop has strived to make the sport available to any athlete who has the desire to learn to vault. When VCU began their track and field program, he started a pole vault program for their athletes in his backyard. Through the Aim High club, he was able to offer countless athletes the opportunity to vault year round. He is a certified VHSL track coach; a former member of the National Pole Vault Development committee; two-time Virginia Coach’s Convention speaker; and twenty-year staff coach at Sky Jumpers pole vault camps. In 2016, he was named National High School Coach of the Year at the National Pole Vault Summit in Reno, Nevada. He identifies one of his greatest accomplishments to be the mentorship of several highly successful pole vault coaches such as Kevin Brown, Bobby Wilson, Eric Sandridge, Kenny McDaniel, and Brian Triolet, to name a few. He credits his own success to knowledge gained while studying under the direction of such renowned coaches as Bill Falk, Jan Johnson, Alan Launder, Jim Bemiller, Vitaly Petrov, and David Butler. Eric Sandridge has been coaching Aim High Pole Vault Club vaulters since 2006. Under the tutelage of Kyle Bishop, Eric obtained numerous district championship titles and all-region awards during his time at Atlee High School. Eric later vaulted collegiately for the College of William and Mary. During his time as the pole vault coach at Lee-Davis High School in Mechanicsville, VA, Eric’s vaulters have won Capital District, Conference 11, Central Region, 5A South Region, and 5A State titles along with numerous other All-State awards. Recently, Sandridge coached Jordan Lipinski to three 5A state titles and a school record 11’9″ and Alex Slinkman to two 5A titles and a school record 16’0″.